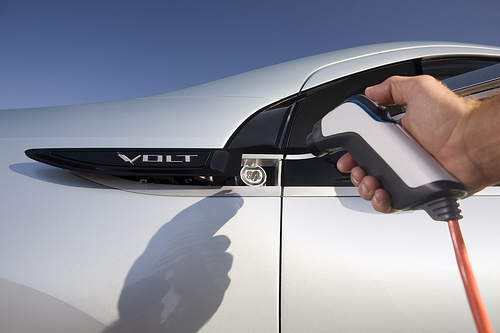 GM has announced the Department of Energy will be providing free 240V home chargers for early buyers of the Volt. Though the Volt can be charged on a standard 120V outlet in about eight hours, a 240V charging station can decrease the charging time by half. The grant money is limited, so the number of chargers available will only be 4,400. ECOtality will be supplying 2,600 chargers as part of the EV Project and 1,800 will come from ChargePoint America, Coulomb Technologies' initiative. Availability is also restricted to a limited number states, but the good news is Seattle made it on the list for both providers. The charging stations have been priced up to $2,000 and GM indicates most units will be installed for free. Individuals receiving chargers must be willing to share data with the DOE, which includes average charge time, energy usage, and the starting and ending times of charges. This data, according to the DOE, will increase the understanding of how electric vehicles are driven, the adoption rate, and charging habits. For more information about applying for a free charging station visit the EV Project and ChargePoint America sites.